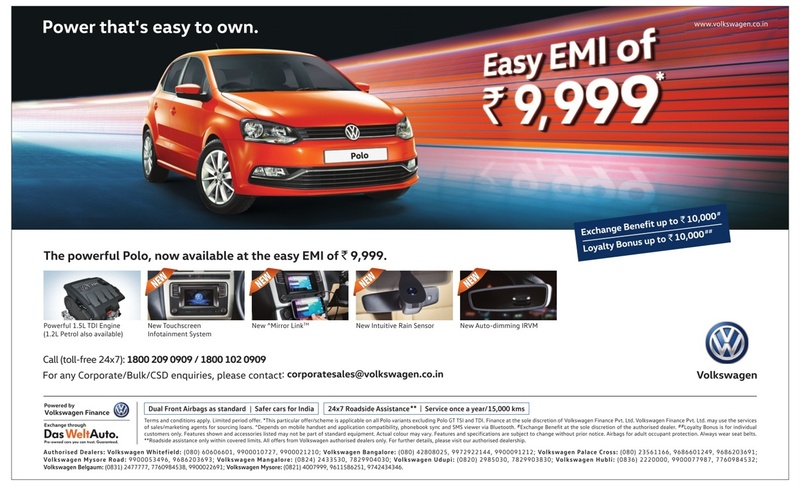 The powerful Volkswagen polo now available at the easy EMI of Rs 9,999. One of the good discount offer on Volkswagen cars. Call toll free phone contact 1800 209 0909/ 18-- 102 0909. For any bulk/CSD inquiries, please contact email: corporatesales@volkswagen.co.in. This offer is updated on MArch 9th 2016 and valid till stocks last. This offer valid all over India including all metro cities: Bangalore, Hyderabad, Mumbai, Delhi, Chennai, Kolkata, Pune, Ahmadabad, Lucknow and Jaipur. Conditions apply.